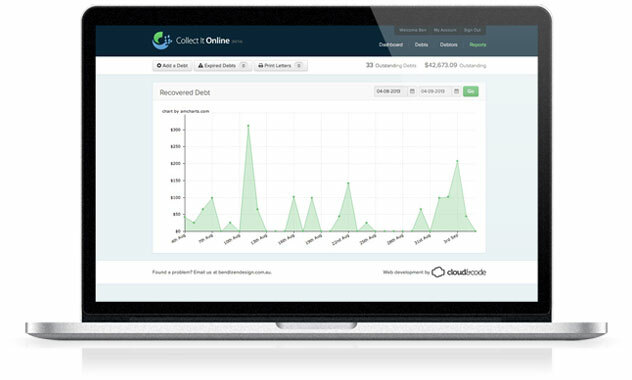 Collect It Online is a debt collection management system for business. Pay only $15 per letter. Save thousands in collection fees. Create demand letters with the click of a button. Debt collection agencies just became redundant. Manually enter your debts into the Dashboard or import the data in bulk from a spreadsheet. Create multiple demand letters with a single click without any complex mail merges. It couldn't get any easier. Each letter is presented on our debt collection agency's letterhead making your debtors sit up and take notice! The Dashboard. Track debts and recovery rate. We'll lead you through the debt collection process. The Dashboard is designed to make your debt recovery tasks as simple as possible. Track your debt and debtor status and overall recovery rate. What if the debtor doesn't pay? Never fear, sometimes the debt recovery process can consist of several stages. We'll guide you through them all for the best possible chance of collecting your hard earned money. Eliminate expensive debt collection fees. Become a debt recovery pro using Collect It Online's automated debt collection system. With no commission fees, you'll pay only $15 per letter.